Latest economic data show global economic slowdown fears overblown. Liquidity, systemic risk indicator points to improvement in Eurozone. Global stock markets are also becoming synchronized on the upside. Are there good reasons for believing that a global economic recession is a legitimate threat? This question has particular significance for equity investors, many of whom are worried that manufacturing weakness in China and Europe could spill over into the U.S. economy. But as we’ll see in today’s report, a number of leading indicators are signaling that global recession fears are exaggerated and that a recovery is most likely in store for both China and the Eurozone in the next several months. While the financial media continue to fret over the global slowdown, a salient piece of good news having positive economic implications was largely ignored. As it turns out, the very same stock market benchmark which was used to justify bear market and recession fears in late 2018 has signaled those fears were premature. The good news is that at the end of the first quarter last week, the S&P 500 Index (SPX) registered its best start to a year since 1998. This fact has more than just passing interest and actually has a forecasting significance. For in years when the SPX was up strongly and didn’t suffer a significant decline in the first three months, it nearly always finished higher at the end of the year. Normally, investors would respond to such an overpowering bullish performance in the SPX by rushing into the market to buy stocks with both hands. This time around, though, investors have largely shunned equities as the sting of last year’s 20% correction in the S&P hasn’t yet disappeared. 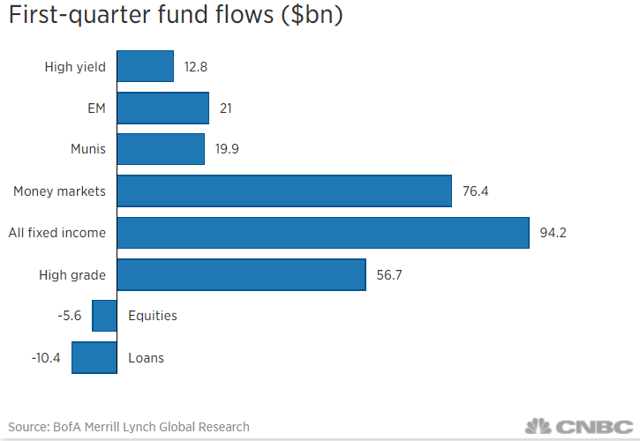 Participants removed $5.6 billion from stock funds in the first quarter of 2019 while committing $94.2 billion into fixed-income funds, according to Bank of America. This was in spite of the 13% gain in the SPX for Q1 and the best quarterly performance in almost 10 years. The lack of participation by retail investors should be viewed as an encouraging sign for the bulls since it suggests that most of the buying in early 2019 was undertaken by informed investors and institutions (as opposed to fickle small investor). The lack of retail investor presence in this rally lends credence to the belief that the market is currently in strong hands. This is also why stock market volatility has been so low in recent months, as reflected by the CBOE Volatility Index (VIX). Market turbulence is normally much higher when retail investors are heavily committed to stocks due to their fickle nature. While the stock market alone can’t predict a recession, it should be pointed out that the SPX is one of the ten key variables in the Conference Board’s Leading Economic Index. The stock market’s strong first Q1 performance is also one reason for viewing recession fears with skepticism, for in years when the U.S. economy was hit with recession, the SPX typically experienced a big hit in the first quarter (e.g. 2007 and 2001). It’s not just the U.S. stock market which suggests that recession fears are overblown, however. The latest data from the Institute for Supply Management showed that U.S. manufacturing activity grew in the U.S. in February, bouncing from its lowest level since late 2016. U.S. construction spending also rose for the third consecutive month in February to a nine-month high, according to the Commerce Department. In China, the Caixin/Markit Manufacturing Purchasing Managers’ Index rose to 50.8 for March, its highest level in eight months. This was above the 49.9 consensus expectation for the index. A reading above 50 is regarded as an expansion signal for China’s manufacturing activity. The latest news over the U.S.-China trade war has also been encouraging. U.S. Treasury Secretary Steve Mnuchin stated last week that ongoing trade negotiations between the two countries were “constructive” and that he had a “productive working dinner” with China’s trade officials. 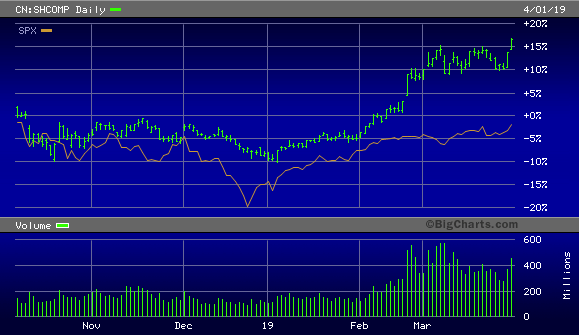 The market evidently believes him based on the recent rally to a more than five-month high in the Dow and SPX. Even China’s benchmark Shanghai Composite Index doesn’t believe the recession hype. The Shanghai Composite has outperformed even the S&P 500 in the year to date and rallied this week to its highest level since last May. If China’s manufacturing sector was in as much trouble as some pundits claim, its equity market wouldn’t be experiencing such a dramatic reversal of last year’s slump. Meanwhile in Europe, equity markets are holding up far better than the headline economic data suggests should be the case. 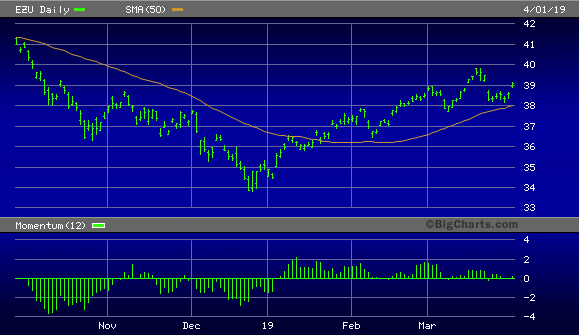 Shown here is the recent performance of the iShares MSCI Eurozone ETF (EZU), which is well above its lows from late 2019 and is holding up nicely above the 50-day moving average. 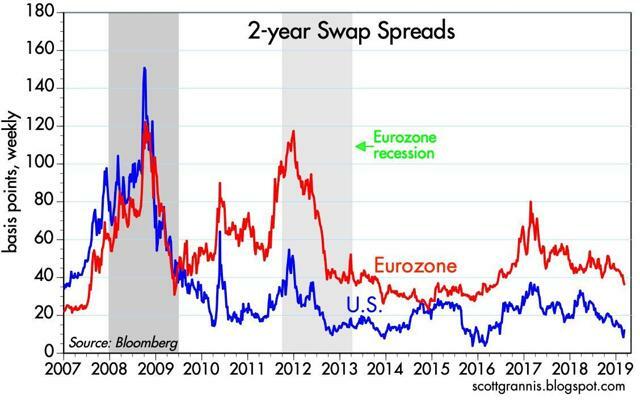 This picture implies that investors in European equities aren’t overly concerned with a recession. With a variety of leading and coincident indicators pointing to recovery, investors have much less reason to fear a global economic recession now than just a few months ago. Indeed, some of the most reliable signs of future economic performance paint an optimistic picture for the intermediate-term (3-9 month) outlook. What’s more, for the first time since 2017, something akin to a global synchronized stock market rally is underway as we enter the second quarter of 2019. In the U.S., retail investors are still feeling the effects of last year’s decline and are heavily committed to safe-haven assets, including bonds, and aren’t over-extended with stock ownership. That’s good news from a contrarian standpoint. All in all, the evidence points to an optimistic outlook for 2019 and supports a continued bullish posture for equity investors. On a strategic note, traders can maintain a long position in my favorite market-tracking ETF, the Invesco S&P 500 Quality ETF (SPHQ). 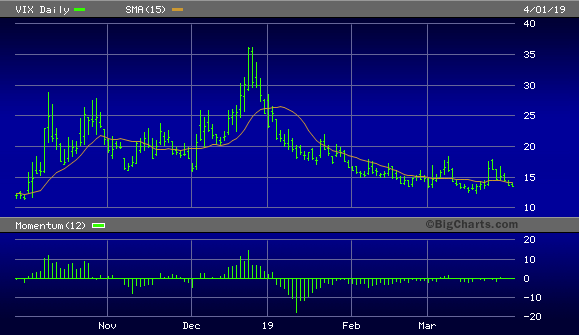 I suggest using a stop-loss slightly under the $30.50 level for this ETF on an intraday basis. Only if this level is violated will I move to a cash position in my short-term trading portfolio. Meanwhile, investors can maintain longer-term positions in fundamental sound stocks in the top-performing real estate, consumer staples, and healthcare sectors. Disclosure: I am/we are long SPHQ, XLE, XLF. I wrote this article myself, and it expresses my own opinions. I am not receiving compensation for it (other than from Seeking Alpha). I have no business relationship with any company whose stock is mentioned in this article.